Celebrating the flavor of fruits of many colors also can give you a real nutritional boost. The exotic purple passion fruit, for example, has a range of health benefits that have recently gained the attention of the medical industry. The fruits healthful nutritional profile includes powerful antioxidants. Including Passion fruit in your dietary celebration are a great way to show self-love. Passion fruits edible soft inner pulp and seeds are surrounded by a hard dark purple rind. Passion fruit is a flowering tropical vine, known as Passiflora, that grows in warm climates, including South America, Australia, South Africa, and India. There are also some sources available in Southern California. This nutrient dense fruit has 63mg of potassium in each fruit, and the seeds may improve insulin sensitivity. The piceatannol compound found in passion fruit seeds has been shown in some studies to improve insulin sensitivity and may help reduce the risk of many diseases, including diabetes. A study showed that 20 mg daily of piceatannol supplementation for 8 weeks significantly decreased fasting serum insulin levels in overweight men compared to the placebo group. 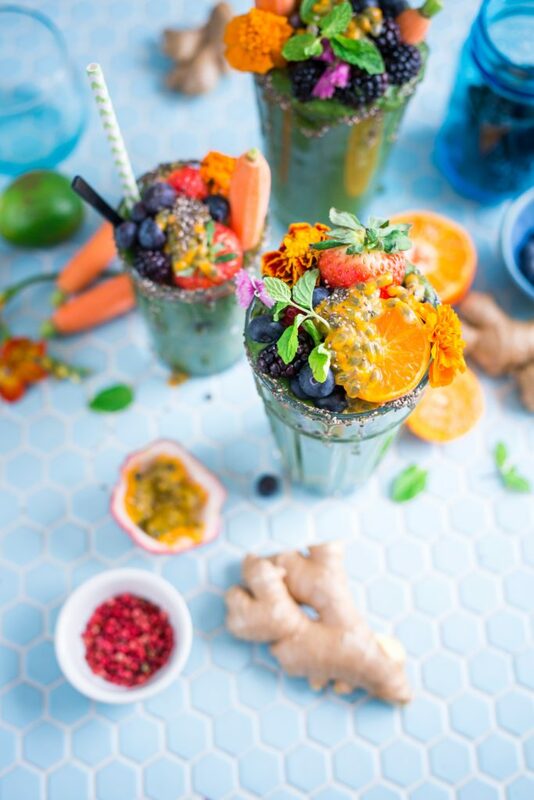 Garnish your fresh fruit juices lavishly with mint and fruits including passionfruit for a nutritional boost your body and soul is sure to celebrate. You can taste the benefits.